Who should make the call to Dig Safe, the contractor or the homeowner? Although some state laws do not specify whether the property owner or contractor should notify Dig Safe, we recommend the contractor make the call. The contractor is usually more familiar with the information required to obtain a Dig Safe ticket. What utility companies are required to join Dig Safe? Municipalities (cities and towns who own water, sewer and drainage facilities) are not required to join the Dig Safe system. It is your responsibility to notify any nonmember companies. How much time in advance do I need to call? In Massachusetts, Maine, New Hampshire and Rhode Island, state law requires a minimum notification of 72 hours, and 48 hours in Vermont. This does not include weekends and legal holidays. The law says I have to 'premark' before calling Dig Safe. What is premarking? State law requires all excavators to premark the area of excavation before notifying Dig Safe. 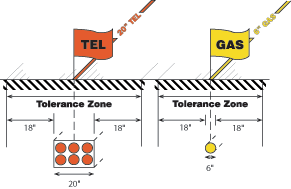 Premarking is defined as marking out the scope of the proposed excavation area, using white stakes, paint or flags. Indicating exactly where the work will take place aids the utility locator in finding the area of upcoming excavation work, keeps operating costs down, and prevents excessive marking in areas where they are not needed. Click here for premarking guidelines. Will private lines on my property be marked? Member utilities companies are responsible to mark only the facilities that they own or maintain. Private underground pipes and cables may not be owned or maintained by member utility companies, therefore they are unable to locate them. It is your responsibility to investigate if any privately owned utilities are in the area. Click here for a list of private utility locators. I've damaged a line. Now what? I need to dig very close to the markings. How deep are the underground lines? The depth of underground facilities vary, therefore state law requires excavators to use non-mechanical means when digging within 18" of a marked underground facility. The current depth of a facility might not be the same as when it was originally installed, due to soil erosion, grading and many other factors. To ensure the safety of excavators and avoid utility disruption, it makes sense to hand dig when working near an underground facility. Should I get a Dig Safe ticket if I'm in the designing stage of a job? A Dig Safe ticket should only be processed if you intend to excavate within 30 days. If you need to know the location of underground facilities for planning purposes, please contact the member utilities directly. They will be happy to assist you with maps or drawings, or an on-site meeting. I need proof of Dig Safe notification. How do I obtain a copy of my Dig Safe ticket? Dig Safe tickets are private records, therefore we may only send copies to the company that originally obtained them. Insurance claims staff or a third party may obtain copies of Dig Safe tickets, if we are provided with a release form from the excavator who originally notified Dig Safe. This form, on company letterhead, should express the permission of the excavator to release these documents to the third party and include the excavator's signature.